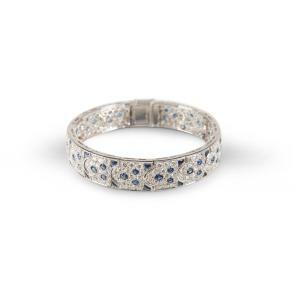 Cartier 18kt diamond and sapphire Arcadie bracelet with 140 diamonds and 75 sapphires (est. CA$30,000-$50,000). 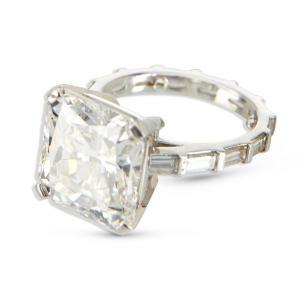 The sale’s expected top lot is this stunning 11-carat platinum diamond ring, size 6.5 (est. CA$175,000-$225,000). 18kt gold Rolex men’s day-date President watch, ref. 1807, made circa 1973 (est. CA$10,000-$12,500). Gorgeous circa 1990 Piaget 18kt diamond and sapphire watch, ref. 8480 H69 (est. CA$80,000-$100,000). 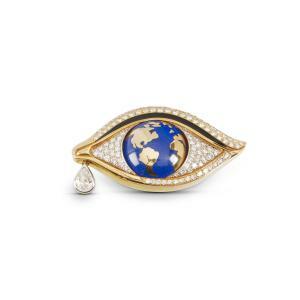 Mia Brattan 18kt diamond, onyx, lapis lazuli eye-shaped brooch with 100 round brilliant cut diamonds (est. CA$8,000-$12,000). Offered is gold estate jewelry by makers such as Tiffany, Cartier and Bvlgari, plus vintage and modern wristwatches by Rolex, Tudor, Omega, Piaget and others. NEW HAMBURG, ONTARIO, CANADA, November 9, 2018 /EINPresswire.com/ — NEW HAMBURG, Ontario, Canada – A curated assortment of antique and modern jewelry and watches, to include a generous selection of fine gold estate jewelry by makers such as Tiffany, Cartier and Bvlgari, plus vintage and modern wristwatches by Rolex, Tudor, Omega, Piaget and others are up for bid in Miller & Miller Auctions, Ltd.’s 312-lot Jewellery & Watches auction. The auction will end on Saturday, November 24th, at 10 am Eastern time, in the Miller & Miller Auction gallery located at 59 Webster Street in New Hamburg, Ontario. Online bidding is open now, on LiveAuctioneers.com, Invaluable.com, iCollector.com and the Miller & Miller website, at www.millerandmillerauctions.com. Phone (519-662-4800) and absentee bids will be accepted. 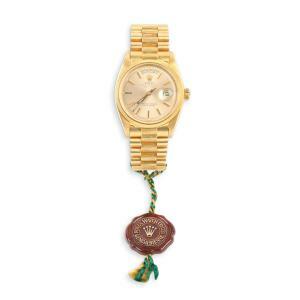 A fabulous example is lot 185, an 18kt gold Rolex men’s day-date President watch, ref. 1807, made circa 1973 and in the rarer “bark” finish. Included are the original box and papers for a watch that has been meticulously serviced and maintained by Rolex. Both case and bracelet are 18kt yellow gold. The pre-sale estimate for the automatic watch is set at CA$10,000-$12,500. Easily the auction’s headliner in terms of high pre-sale estimates is a stunning 11-carat platinum diamond ring, size 6 ½, expected to slip onto a new finger for CA$175,000-$225,000. The ring’s brilliant/scissor cut diamond boasts SI1 clarity and J color and comes with a GIA grading report. The band is surrounded by 14 straight baguette cut diamonds having a total weight of 1.87 carats. Another star lot of the sale is a fine expression of Cartier’s work: an 18kt, diamond and sapphire Arcadie bracelet, containing 14 links, each link pave-set with 140 round brilliant-cut diamonds weighing about 9.08 carats, of good color and quality, and accented by 75 mixed, fancy-cut blue sapphires, mill grained bezel-set on the links, weighing 6.89 carats (est. CA$30,000-$50,000). 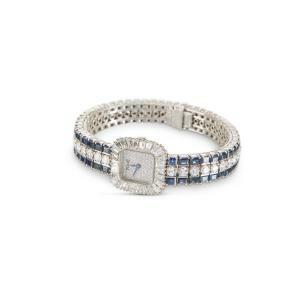 Ladies’ watches will be led by a gorgeous circa 1990 Piaget 18kt diamond and sapphire watch, ref. 8480 H69, quartz movement, with an 18kt white gold diamond and sapphire bracelet (est. CA$80,000-$100,000); and a circa 1960s Rodania Geometer watch, ref. 5621H, with stainless steel case and bracelet, original box and Valijoux Caliber 72 movement (est. CA$1,500-$2,000). A graduated, single-strand necklace featuring 31 South Sea cultured pearls and pave set with 54 brilliant cut diamonds weighing approximately 1.90 carats, of an average VS grade, is expected to fetch CA$12,000-$15,000. Also, a custom-designed, hand-crafted Mia Brattan 18kt, diamond, onyx, lapis lazuli eye-shaped brooch, with 100 round brilliant cut diamonds of VVS-VS clarity and G-H color and one 1.03-caat pendeloque cut diamond, should gavel for CA$8,000-$12,000. Men’s Rolexes will be plentiful. A circa 1972 red Submariner, ref. 1680, with stainless steel case and bracelet and fitted to a modern oyster band, including box, should hit CA$18,000-$20,000; while a blue Submariner, circa 2009, ref. 16113, boasting an 18kt yellow gold and stainless steel case and band, virtually unworn with original box and papers, is estimated at CA$8,000-$10,000. Other noteworthy men’s Rolex watches include a Datejust Turnograph model, ref. 116263, circa 2015, with 18kt yellow gold and stainless steel case and dial, showing the date and having a bi-directional rotating bezel (est. CA$6,000-$8,000); and a circa 1989 Datejust, ref. 16233, also having an 18kt yellow gold and stainless steel case and band, and date (est. CA$2,000-$3,000). Fans of vintage Omega men’s watches are in for a pair of treats. One is a genuine World War II-era Weems Royal Air Force pilot’s watch, circa 1940-41, ref. CK2129, with a stainless steel case, canvas watch band and non-functioning rotating bezel lock (est. CA$2,500-$3,000). The other is a circa 1954 Constellation watch, ref. 2782/2799 SC, with 18kt yellow gold case, leather band, Caliber 354 “Bumper” automatic movement and brassed crown (est. CA$2,000-$2,500). The auction also features a selection of railroad pocket watches. Examples include a Hamilton “946” watch with gold-filled case and a rare 24-hour Canadian dial (est. CA$1,000-$1,200); and an Illinois “Bunn Special” watch, with a gold-filled case and 24 jewels (est. CA$800-$1,200). Previews will be held on Friday, November 23rd, at 6 am Eastern time, and on Saturday, the date of auction, November 24th, from 8:30 am until the first gavel falls at 10 am Eastern. People can pre-bid live right now online at the Miller & Miller website: www.MillerandMillerAuctions.com. Miller & Miller Auctions, Ltd. is a seller of high-value collections between $200,000 and $3 million. Individual items of merit are always considered. The firm is Canada’s trusted place for collectors to buy and sell. To consign a single piece, an estate or a collection, you may call them at (519) 573-3710 or (519) 716-5606; or, you can send an e-mail to info@millerandmillerauctions.com. To learn more about Miller & Miller Auctions and the Nov. 24th auction, visit www.MillerandMillerAuctions.com.